Today, we're going on a field trip to a teacher's house. 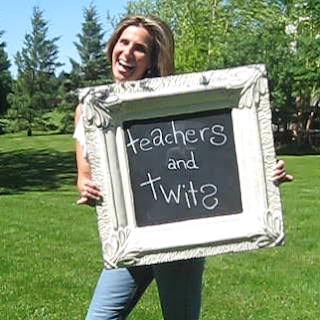 That's because Renée Jacobson isn't just any teacher - she's a twit. You can leave a comment on Renee's site, but you have to raise your hand first. 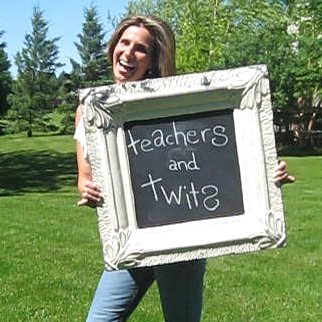 And now that I've resorted to name-calling with my gracious host, click on over to read about one of my favorite teachers, Mrs. Wheeler. No, Jamie. Nathan Fillian was NOT your first grade teacher. Liar! We just had an IT Department (me) meeting. We needed to prioritize the day's activities. Our decision? Eat the grapefruit. I now have a mini fridge in my office. I hide it under my desk since I don't know if it's allowed. It has grapefruit in it. I wish the horn in my car had two settings: A light and happy, "Please pay attention to the green light. Thanks! ", and a hot and heavy, "Quit trying to run me over with your obnoxiously large truck!" My boss just came in and said, "Can you help me send the client a file in Secret Squirrel Mode?" We got an IT questionnaire from a vendor. One of the questions was "Do you encrypt all laptops while at rest?" I resisted the urge to respond that our laptops are only encrypted when they are moving. That's how you scramble the data on the drive, right? I moved 8 employee's computers to different desks this morning. That will make 8 new helpdesk tickets when they come in. Users have a knack for not telling you about random small issues with their computers, and then blaming it on you whenever there's a change. Example: User: I'm locked out of my account. It must be because I switched desks. Tell me something funny and/or not funny. Happy Monday! For the past few months, my son has been using a crib. He used to sleep in a Graco Pack 'n Play. When you're about to have your first baby, you stalk the aisles of Babies "Backwards R" Us with uncontrolled glee. You see, you scan, you register. You are unstoppable. You have a laser gun. What you don't do is stop and think. Is the item really worth a house payment? How long will my child use it? Can I get a used one on Craigslist (the item, not the baby (those are on eBay, not Craigslist))? You see the Pack 'n Play. It's a playpen ("baby jail"). It's a bassinet. It's a changing table. It's portable and lightweight, yet sturdy enough to support a polar bear. You get it home, full of multi-function expectations. You can't find the instructions, but that doesn't matter since you never use them anyway. This thing is for babies; how hard could it be? After unpacking all the parts and scattering them around the living room, you start to wonder if you've bit off more than you can chew. There weren't that many parts on the store display, that's for sure. Are you assembling a 747 or a playpen? You dive in and start to make headway. The base structure is easy enough. Now for the attachments. The electronic noise-making thingy plugs in here. The diaper changing flip-out jobber slides in there. Or maybe there. Oops, upside down...and on the opposite side. The bassinet cover clips in right here...and velcros over there...and snaps down here...now for a little glue...where are the staples? 4 hours and two migraines later, it's finished. You stand back with pride. Now to carry it into the bedroom. As you pick it up, you feel something on the bottom. The instructions, helpfully taped under the Pack 'n Play. Helpful, because the darn thing won't fit through the door and now you have to take it apart and start over. Don't buy stuff for babies. Have an experienced parent over to put stuff together. Getting stuff ready for your kids can expand your vocabulary more than Rosetta Stone. Think twice before buying a Pack 'n Play / garage door opener / toaster / satellite dish. What awesome things have you put together? What have you bought that was multi-functional overload?